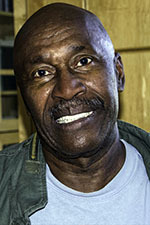 Harrison Branch was born in New York City in 1947. He grew up in Manhattan, attending P.S. 184, James Fenimore Cooper Junior High School, and the High School of Commerce. Branch became interested in photography at a young age and, after graduating from high school in 1965, moved across the country to begin formal studies in the discipline at the San Francisco Art Institute. He graduated five years later, in 1970, with a B.F.A. in Photography. From there Branch moved on to master's work at Yale University, which he completed in 1972, compiling a graduate thesis of fifteen prints titled, "A Photographic Study of Textures and Patterns in Natural Environments." That same year, Branch accepted a position as an assistant professor in the Art department at Oregon State University. During his tenure at OSU, Branch taught numerous photography classes, including courses in both the history and science of photography. 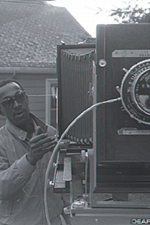 He also helped to develop a new degree-granting program in Photography within the Art department. Promoted to associate professor in 1977 and to full professor in 1984, Branch conducted most of his teaching and darkroom work in what was then known as the Industrial Building, now called Cascade Hall. As an artist, Branch spent many years exploring an interest in relationships of tonal scales between silver and non-silver photographic prints. Specifically, during the early 1980s, he investigated the methods used to create platinum-palladium prints and became intrigued by the superiority of the process as compared to silver print photography. He has also worked with Platinotypes and has studied the subtle ways in which light becomes subject matter. Throughout his years as a professional, Branch has worked primarily with bellows cameras, which are far more technically intricate and often much larger than are the conventional cameras of recent decades. The subject matter of Branch's photography has varied over time, but has often included undeveloped natural areas. He has exhibited his work regionally, nationally, and internationally in venues including the Oakland Museum, the George Eastman House in Rochester, New York, and the Bibliothèque Nationale in Paris. In 2013, after forty years at Oregon State, Branch retired as Professor Emeritus. In addition to continuing to create art, Branch has been heavily involved with the Corvallis Police Auxiliary as a retiree.